Which Spin Bike Should I Buy? Posted on March 29, 2019 , in Exercise Bikes. The recent evolution of spin cycle classes has caused a spike in the number of people looking to buy a stationary bicycle for home exercise. Using a spin bike is a great way to give yourself a cardiovascular workout while avoiding bad weather, dangerous traffic, and air pollution. If you’re looking to avoid having to pay each time you want to get in a workout, with the added convenience of being able to jump on the bike anytime you want, you might consider buying a machine for your own home. To help with those asking the question, “Which spin bike should I buy?” we’ve come up with an article going over the various features you should keep in mind when trying to find a stationary bike that works best for you. There’s quite a wide price range when it comes to home spin bikes. How much you want to spend on your bike is up to you, but it will also probably make sense to honestly ask yourself how much experience you have on a spin bike, how much do you expect to use it and what are you trying to accomplish with your purchase. If it’s something that you probably won’t use every day or you’re just looking to work on some mobility issues you could easily get away with a cheaper, lower end model. If you’ve already ridden several hundred (or thousand!) 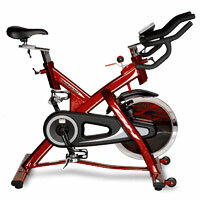 miles at the gym or spin class, investing in a sturdier, more expensive model may be worthwhile. Larger athletes will need to make sure that their bike is rated for their size. Opt for a bike that’s rated for a weight that’s above your current measurements. Getting a bike with a rating too close to your weight could result in quicker wear and tear on the parts. That said, when you think that stationary bikes are used by most professional athletes, some who weight well in excess of 300 pounds, there will definitely be a bike on the market that fits your needs. The flywheel is one of the most important parts of a spin bike, so understanding what you’re getting should be high on your list. Heavier flywheels are typically considered better because they provide a smoother and more natural feeling ride. Flywheels that are over 30 pounds are where a difference can really be noticed in ride fluidity. Resistance can be provided by a belt drive or by magnetic brakes. Belt drives, although quieter, are usually found on the basic spin bike models. Magnetic brakes are normally found on higher-end machines and come with the associated price differential. A lot of modern spin bikes come with electronic readouts that can measure everything from speed and time to the number of calories you’re burning. If these factors are important to you, it could make it more likely that you’ll use the bike on a regular basis. If all you want to do is get on and ride, a simple speedometer and a clock on your wall can take care of most of your needs. If you are ready to start shopping for an indoor bike, download this month’s promotions to save first.